The Cumberland & Dumfriesshire Farmers Mart P.L.C. had forward 46 prime cattle, 2 young bulls, 34 over thirty month cattle, 5,032 prime hoggs and 4,371 cast ewes & rams at their weekly sale at Longtown on Thursday 25th March, 2010. The prime cattle again met a buoyant trade with handy weight cattle very good to sell. Top price was 186.5p for a Limousin heifer from Messrs Blaylock, Hallburn and purchased by W Kirkup & Sons, Butchers, Longtown, others to 167.5p No 6 Stonehouse, 166.5p Houghton House. Belgian Blues to 185.5p from Gardrum and purchased by W Kirkup, others 178.5p Gardrum; Charolais to 175.5p Hallburn, 171.5p Plumpe, 167.5p Sceughdyke; Angus 157.5p Plumpe. Limousin steers to 167.5p No 6 Stonehouse, 166.5p The Gill, 161.5p Bleatarn; Simmental 152.5p Sceughdyke. Young bulls to 133.5p for Friesians from Southlambhill. More grazing cows were on offer and saw them meet a brisk trade. Top was 133.5p for a Limousin heifer from G. Brodie, Cadgillhead, 129.5p Plumpe; Shorthorn 118.5p Synton Park Head; Angus 121.5p Plumpe & Synton Park Head. Cows to 111.5p for Charolais from Mosside; Limousin 110.5p, 101.5p, 99.5p Synton Park Head; Friesian 98.5p Southlambhill, 90.5p, 86.5p Plumpe; Bluegrey 83.5p Moorend; British Blue 96.5p Snab, 87.5p Gallowberry; Angus 104.5p, 91.5p Synton Parkhead, 87.5p Horseholm. There was a larger show of prime hoggs with the sale levelling at 197.1p Good quality export types were easily sold and short of requirements, regularly selling between £2 and £2.40 per kilo with the very best quality hoggs breaking the £3 per kilo mark. Top price per head was £120.50 twice for Texels from J. MacTaggart, Orchardton Mains and for Beltex from Lisa Irving, Netheralbie. 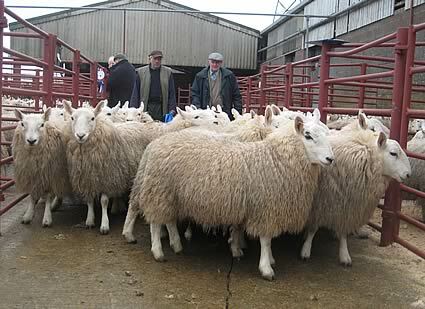 Top price per kilo was 318p for Beltex from Messrs Eastham, Naddle. Included on this day was the annual Cheviot show & sale with the champion pen being for 20 South Country Cheviots weighing 44kilos from W & J Glendinning, Crawsknowe and realised £90 selling to the judge Mr. John Mitchell, Dunbia on his final outing to Longtown before moving to a new position. Other prices: Texels £119.50 Orchardton Mains & Kilncroft, £118.50 Orchardton Mains; other Beltex £105.20 Station Road, £100 Winterhope; Suffoolks £96.80 Tone Hall, £96.50, £95.50 East Cliff, £93.80 Sceughdyke; Cheviots £90 Crawsknowe & Tushielaw, £89.20 Falnash, £88.50 Clonhie & Tushielaw; Charollais £90 Leaona Villa, £89.80 Oswie, £88.50 Leaona Villa & Thackwood; Halfbred £80 Clover Hill; Greyface £90.50 Finnineness, £86.20 Kirkland Green, £85.80 West Farm; Cheviot Mules £85.50 North House; Leicesters £94.50, £81.20 Quarry House, £79.50 Finnieness; Blackface £88.80 Smalmstown, £88.20 Sceughdyke, £86.50 Quarry House & Yett; North Country Cheviots £96.50 Edge Farm, £93.50 Orchardton Mains & Easthouse, £93.20 Station Road, £92.80 Halket Leathes; Swaledales £83.50 Hollinclose, £80 Kilncroft; Jacobs £84.50 The Green; Lleyns £84.50, £83.80 Whitcastles; Cambridge £77.80 Kirkwood Mains; Welsh £72.80 Longbrough Fauld. Lightweight hoggs to £114.50 for Beltex from Naddle Farm; Cheviot £71.80 Unthank, Butterdales & Falnash; Texels £73.20 Clonrae, £70.50 East Mey; Charollais £73.80, £73.20 The Cottage; Greyface £72.20 Clonrae, £67.50 Aimshaugh; Blackfaces £73.20 Clonrae, £70.50 Spoutbank; North Country Cheviot £65.20 Raeburnfoot; Swaledales £57.80, £52.50 Sunday Sight; Jacobs £68.50 Skelfhill; Cambridge £74.20 Kirkwood Mains; Easycare £64.80 Kersheugh, £62.20 Baillie. A larger show of cast ewes and rams with no change to the trade on the week. All types were easy to sell to the usual full ring of buyers. The sale averaged £88.37. Top price heavy ewe was £180.50, £178.50, £173.50 for Texels from Rascarrel; Suffolks £177.50 Lands; Suffolk x £163.50 Roadside, £158.50 Kilnfordcroft, £156.60 Severs; Bleu de Maine £106.50 Dunjop; Rouge £110.50 Jonesboro; Charollais £156.50 Seavers, £143.50 Thackwood; Halfbred £126.50 Broomlands; Greyface £124.50 West Farm, £120.50 Sceughdyke, £110.50 Cardew Hall; Cheviot Mules £158.50 Rascarrel, £117.50 Broomlands; Leicester £108.50 High Farm & Hole House, £106.50 Severs; North Country Cheviot £136.50 The Park, £110.50 Waterfoot, £101.50 Ericstane; Beltex £134.50 Dunjop, £130.50 Severs, £108.50 Woodhead; Lleyn £90.50 Whitecastles, £88.50 Harperhill; Zwartble £89.50 Jonesboro; Vendeen £76.50 Kirkwood Mains. Light ewes to £95.50 for Cheviots from Alton, £93.50 Severs, £90.50 Seavers; Blackface £78.50 Wanwood Hill, £71.50 Newbigging Walls, £70.50 Longyester; Swaledale £76.50 Wolfcleugh, £66.50 Aimshaugh; Herdwicks £33.50 Eastside; Jacobs £59.50 The Nook; Kerry £67.50 Whitcastles. Rams to £148.50 for Texels from Chapel Farm, others to £138.50 Roadside & Fowrass, £136.50 Rashee; Suffolks £130.50, £126.50 Roadside; Suffolk x £114.50 Rashee, £110.50 Jonesboro, £104.50 Severs & Eastside; Cheviots £89.50, £88.50 Upper Hindhope, £83.50 Severs; Charollais £108.5p Roadside, £103.50 Rashee; Leicesters £118.50, £103.50 Severs, £98.50 Gapshield & Severs; Blackface £74.50 Stackbraes, £66.50 Chapel, Bush of Ewes; North Country Cheviot £92.50 Rashee, £89.50 Achow; Swaledale £56.50 Queenshaugh; Beltex £112.50 West Farm; Lleyn £68.50 Whitcastles; Zwartble £76.50 Jonesboro; Cambridge £84.50 Kirkwood Mains.